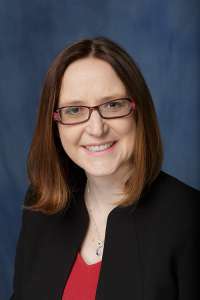 Stephanie Staras, Ph.D., an associate professor in the Department of Health Outcomes and Biomedical Informatics (HOBI) and a faculty member in the Institute for Child Health Policy (ICHP), recently was elected for membership in the Society for Pediatric Research (SPR). Acceptance into the SPR recognizes Dr. Staras’ significant contributions to pediatric research. Staras’ research program at HOBI focuses on using implementation science to prevent disease and reduce health disparities. She has served as principal investigator on seven implementation research grants, including two NIH grants, for a total of nearly $750,000. A main focus of Staras’ work is reducing human papillomavirus (HPV)-related cancer cases and associated disparities. She has a nine-year continually funded research program of increasing HPV vaccination among Florida adolescent girls and boys. Dr. Staras’ work highlights the strong association between HPV vaccine initiation and parents’ beliefs about the ability of the HPV vaccine to safely prevent cancer. Additionally, she led one of a handful of studies to assess a direct link between provider recommendations and parent beliefs about HPV. By simultaneously targeting parents with reminders and providers with an in-clinic, parent-tailored decision aid, Dr. Staras’ real-world, multi-level implementation trial demonstrated a synergistic increase on HPV vaccine initiation among girls. To target interventions at geographic areas of the greatest need, Staras is characterizing HPV-related disease burden in the University of Florida Cancer Catchment Area by triangulating data with an environmental scan that includes vaccination records, stakeholder interviews, and a provider discrete choice experiment. Staras also contributes her implementation science expertise to research grants on meningococcal B vaccination, smoking cessation, and health screenings for dental patients. Betsy Shenkman, Ph.D., chair of HOBI and director of ICHP, and Lindsay Thompson, M.D., M.S., associate professor in the Department of Pediatrics and ICHP assistant director for clinical research, sponsored Staras’ SPR membership application. Thompson, a member of SPR, has collaborated extensively with Staras for the past 8 years. Drs. Shenkman and Matthew Gurka, Ph.D., professor and associate chair of HOBI and associate director of ICHP, are also SPR members.